Friends foosball Written on February 23, 2009, by Ingeborg. Kudos to my ex-homemate Lieke Ypma. 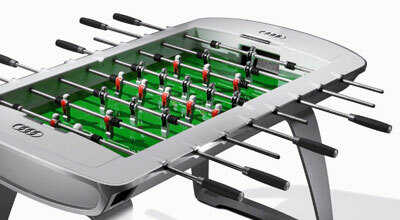 The design for a foosball table she made at Audi in Ingolstadt 4 years ago has been produced. “The cars around me in the design studio were an inspiration. Since it takes 4 years for those cars to hit the streets, that was the ‘leadtime’ for my kickertisch too.” I fantasize the table in our livingroom has something to do with it too.